How does my hand compare to the foot of Emperor Charles the Great? One of the most ancient glove making regions is Grenoble in France. In this region, they used the pouce (in other languages: inch, zoll, hüvelyk) as measurement. This length measurement, as most of the measurements at the time, was linked to the emperor’s body. The French pouce was based on the shoe size of Charles the Great. Charles the Great is considered the founding father of France and Germany; sometimes he is even referred to as the father of Europe. He was the first Emperor in Western Europe after the fall of the Roman Empire. One Charles-the-Great-type foot equals 32.484 cm, and it was divided into 12 parts called zolls. 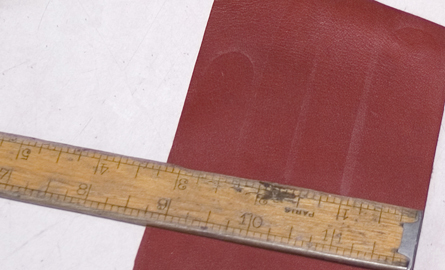 These measurements were also used by Hungarian glove makers. The development of 17th century manufacturing, the forming of international markets, and later the industrial revolution each pushed the industry towards the standardization of measurements. The solution was the introduction of the metric system in 1791. However, traditional measuring tools are still in use internally at many workshops.